Opel engineers are out testing the first redesigned model post the brand’s sale by General Motors to France’s PSA Group one year ago. The model is a replacement for the current Mokka X, which does duty in the United States as the Buick Encore. The Mokka X is one of the most popular models in the subcompact crossover SUV segment. It was only introduced in 2012 but Opel is keen to replace it. The new model is confirmed to arrive on the scene in 2020. Why the hurry to replace the strong-selling current model? In its turnaround strategy for Opel announced last November, PSA Group said it planned to transfer the entire portfolio of Opel cars to PSA Group platforms by 2024. The rapid shakeup is due to Opel’s sale agreement made between GM and PSA Group, which blocks Opel from selling vehicles based on GM platforms in markets where GM brands operate. PSA Group also has to pay GM royalties for use of its platforms and powertrains. The platform for the new Mokka X will be PSA Group’s new CMP (also known as EMP1) design for subcompact and compact cars. The platform, which incorporates electrification technology, made its debut this month in the DS 3 Crossback. 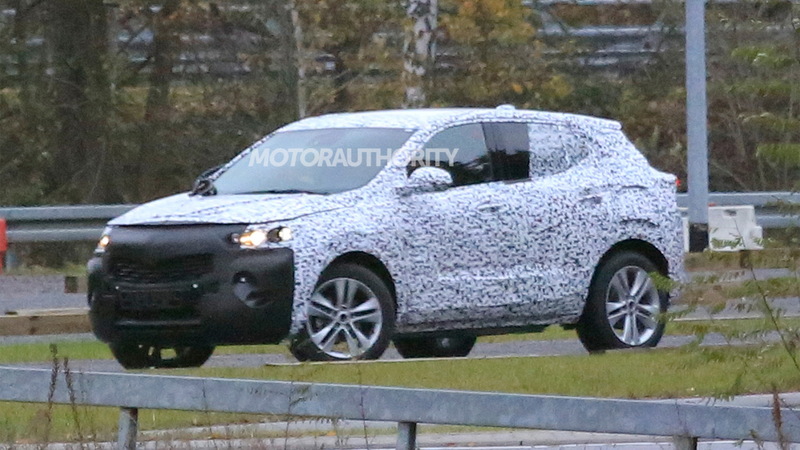 Judging by our spy shots, the new Mokka X will feature evolutionary styling. After all, PSA Group would be silly to throw away the good standing of the current model. There are some clear differences, though. The vehicle looks longer and lower. The grille on the new Mokka X also sits lower, although it features the same mesh pattern used on the current model. It will likely mimic the new Vizor design previewed on Opel's GT X Experimental concept (shown above) unveiled earlier this year. There’s no word on what powertrains will be offered, but you can count on the most potent being a 1.6-liter turbocharged inline-4. An electric option may also be offered at some point. It also isn't clear what the fate of the Buick Encore is, though there are rumors GM is planning its own redesign of the Buick crossover. The redesigned Mokka X is one of eight redesigned or updated models Opel will introduce by the end of 2020. Others we know of include updated Astra and Insignia models, as well as a redesigned Corsa. At the same time Opel will drop low-volume sellers like the Adam, Cascada and Karl. We get the Cascada in Buick showrooms and our version could be on its way out too since Opel is the manufacturer, however Buick remains quiet on the matter.